More than 350,000 Porsche Macans have been sold since the model went on sale in 2014 - making it the firm's most successful car. Now, with increasing competition from the likes of the BMW X4 and Mercedes-Benz GLE Coupe, Porsche has revealed a facelifted version. Displayed at an event in Shanghai (China is the Macan's biggest market), the new Macan looks an awful lot like the old model. At least until you get to the back, anyway, where there's a full-width rear light strip similar to that on the latest Cayenne. Anoraks will note there's also new LED headlights at the front and buyers get a choice of new colours including Miami Blue, Mamba Green, Dolomite Silver and Crayon Grey. There are new 20-inch and 21-inch wheels (with different size tyres at the front and rear), while Porsche also says it has tweaked the suspension to improve stability and comfort. Inside, there's a new full-HD 11-inch infotainment display previously used on the Cayenne and Panamera, while all models feature Porsche's Connect Plus module. This uses the cloud to provide services such as real-time traffic information and intelligent voice control, while a new app allows you to share off road experiences in the Macan. Should you ever accidentally venture off road. Other updates to the cabin are minor - the air vents have been moved, while a GT sports steering wheel from the 911 is available as an option. A heated steering wheel is also available, while a Sport Response button is integrated into the wheel as part of the optional Sports Chrono package. This increases throttle response for about 20 seconds - handy for overtaking manoeuvres and the like. A new Traffic Jam Assist feature provides partially automated acceleration and braking at speeds of up to 37mph, while also assisting with steering in slow-moving traffic. Engine choices are yet to be confirmed, but expect a selection of turbocharged petrol units and, for the time being at least, no diesels. 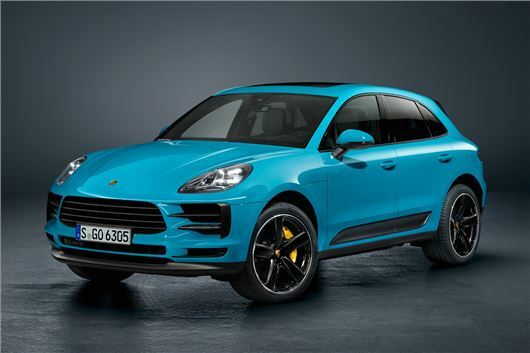 Prices will start below £50,000 when the new Macan goes on sale in the UK later in the year.